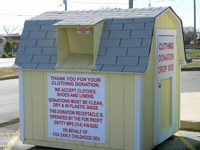 PLEASE SHOP YOUR LOCAL ST LOUIS AREA DROP BOX HOSTS! They have participated in providing over $400,000 to local St Louis metro area charities last year. Their support is crucial to this program.